Baldick, Chris (1993)Introduction, in The Oxford Book of Gothic Tales. Oxford: Oxford University Press. Birkhead, Edith (1921). The Tale of Terror. Bloom, Clive (2007). Gothic Horror: A Guide for Students and Readers. Basingstoke: Palgrave Macmillan. Botting, Fred (1996). Gothic. London: Routledge. Brown, Marshall (2005). The Gothic Text. Stanford, CA: Stanford UP. Butuzov, A.E. (2008). Russkaya goticheskaya povest XIX Veka. Clery, E.J. (1995). The Rise of Supernatural Fiction. Cambridge: Cambridge University Press. Cornwell, Neil (1999), The Gothic-Fantastic in Nineteenth-Century Russian Literature, Amsterdam; Atlanta, GA: Rodopi, Studies in Slavic Literature and Poetics, volume 33. Cook, Judith (1980). Women in Shakespeare. London: Harrap & Co. Ltd.
Davenport-Hines, Richard (1998) Gothic: 400 Years of Excess, Horror, Evil and Ruin. London: Fourth Estate. Davison, Carol Margaret (2009) Gothic Literature 1764–1824. Cardiff: University of Wales Press. Drakakis, John & Dale Townshend (2008). Gothic Shakespeares. New York: Routledge. Eagleton, Terry (1995). Heathcliff and the Great Hunger. NY: Verso. Fuchs, Barbara, (2004), Romance. London: Routledge. Gamer, Michael, (2006), Romanticism and the Gothic. Genre, Reception and Canon Formation. Cambridge: Cambridge University Press. Gibbons, Luke, (2004), Gaelic Gothic. Galway: Arlen House. Goulart, Ron (1986) "The Pulps" in Jack Sullivan (ed) The Penguin Encyclopedia of Horror and the Supernatural: 337-40. Hadji, Robert (1986) "Jean Ray" in The Penguin Encyclopedia of Horror and the Supernatural edited by Jack Sullivan. Haggerty, George (2006). Queer Gothic. Urbana, IL: Illinois UP. Halberstam, Judith (1995). Skin Shows. Durham, NC: Duke UP. Horner, Avril & Sue Zlosnik (2005). Gothic and the Comic Turn. Basingstoke: Palgrave Macmillan. Jackson, Rosemary (1981). Fantasy: The Literature of Subversion. Kilgour, Maggie, (1995). 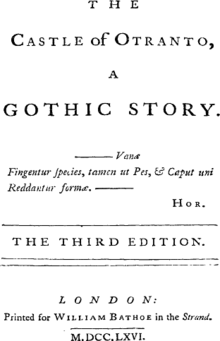 The Rise of the Gothic Novel. London: Routledge. Jürgen Klein, (1975), Der Gotische Roman und die Ästhetik des Bösen, Darmstadt: Wissenschaftliche Buchgesellschaft. Jürgen Klein, Gunda Kuttler (2011), Mathematik des Begehrens", Hamburg: Shoebox House Verlag. Korovin, Valentin I. (1988). Fantasticheskii mir russkoi romanticheskoi povesti. Medina, Antoinette, (2007). A Vampires Vedas. Mighall, Robert, (2003), A Geography of Victorian Gothic Fiction: Mapping History's Nightmares. Oxford: Oxford University Press. Mighall, Robert, (2007), "Gothic Cities", in C. Spooner and E. McEvoy, eds, The Routledge Companion to Gothic. London: Routledge, pp. 54–72. O'Connell, Lisa (2010). The Theo-political Origins of the English Marriage Plot, Novel: A Forum on Fiction. Vol. 43, Issue 1, pp. 31–37. Punter, David, (1996), The Literature of Terror. London: Longman. (2 vols). Punter, David, (2004), The Gothic, London: Wiley-Blackwell. Sabor, Peter & Paul Yachnin (2008). Shakespeare and the Eighteenth Century. Ashgate Publishing Ltd.
Salter, David (2009). This demon in the garb of a monk: Shakespeare, the Gothic and the discourse of anti-Catholicism. Vol. 5, Issue 1, pp. 52–67. Sedgwick, Eve Kosofsky (1986). The Coherence of Gothic Conventions. NY: Methuen. Shakespeare, William (1997). The Riverside Shakespeare: Second Edition. Boston, NY: Houghton Mifflin Co.
Skarda, Patricia L., and Jaffe, Norma Crow (1981) Evil Image: Two Centuries of Gothic Short Fiction and Poetry. New York: Meridian. Skarda, Patricia, (1986) "Gothic Parodies" in Jack Sullivan ed. (1986) The Penguin Encyclopedia of Horror and the Supernatural: 178-9. Skarda, Patricia, (1986b) "Oates, Joyce Carol" in Jack Sullivan ed. (1986) The Penguin Encyclopedia of Horror and the Supernatural: 303-4. Sullivan, Jack, ed. (1986). The Penguin Encyclopedia of Horror and the Supernatural. Summers, Montague (1938). The Gothic Quest. Townshend, Dale (2007). The Orders of Gothic. Varma, Devendra (1957). The Gothic Flame. Varma, Devendra, (1986) "Maturin, Charles Robert" in Jack Sullivan (ed) The Penguin Encyclopedia of Horror and the Supernatural: 285-6. Wisker, Gina (2005). Horror Fiction: An Introduction. Continuum: New York. Wright, Angela (2007). Gothic Fiction. Basingstoke: Palgrave.